What a lovely morning enjoying coffee, mindfulness and NLP in Cullercoats. I’ve found a new haunt, aptly named Cullercoats Coffee. 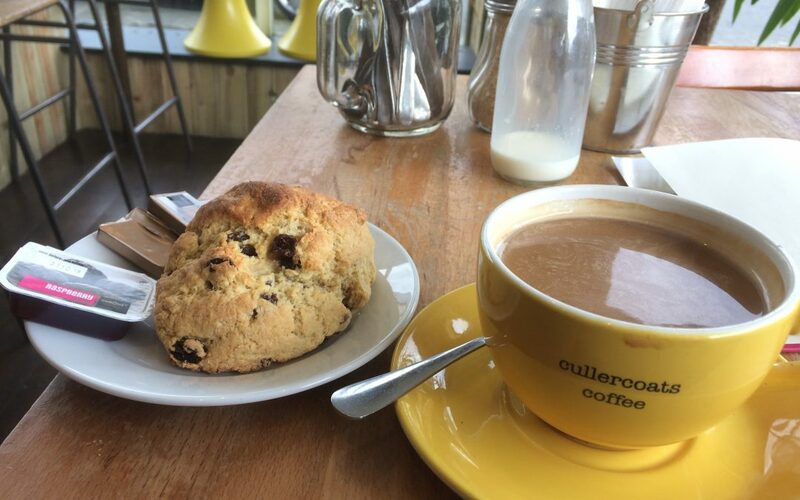 Now apart from the fact that the coffee and fruit scones are yummy, the staff are incredibly friendly and welcoming. It really is one of the nicest atmospheres I have ever come across in a cafe. Sitting there today I could see people of all ages and backgrounds. It’s wonderful to see that it’s fast becoming a real community hub without any hint of pretension. This isn’t something you see much of these days, so it’s wonderful to experience this returning to Cullercoats. I try to visit each week, particularly if I cannot find the words I want to write then it’s useful to have a change of venue. There’s something about the atmosphere here that helps me become ‘unstuck’ and tune in to what I want to say. So, what is it that makes this place so good? What is it that creates this wonderful atmosphere? I’ve no doubt that the tone is set by the manager, in this case the owner Matt. Customers are greeted as they enter, not in that OTT Disney way; just a warm friendly and authentic welcome, the type you give to someone who visits you at home. There’s always time for a quick chat. It’s not just Matt, it’s the whole team; they seem to look for ways to help you. Again this isn’t in a way that’s intrusive or artificial; it comes from being fully aware of what’s going on around you, taking a real pride in your work and being passionate about what you do. What is it that makes this a ‘mindful’ coffee? Mindfulness is about being completely present in the moment. I find it surprising that I’m able to do this among the noise and bustle of this lovely place. Normally I need to prepare myself; focus on my breathing in peace and quiet before I begin to notice what is happening in the present moment. Yet here it’s wonderful to sit and fully experience all the sounds, feelings, tastes. Noticing the way I interact with each and let each go as the next moment is there to experience. This really isn’t something I’m used to when I go for a coffee. How many times are we so engrossed in a conversation, reading the paper or so absorbed with an unhelpful internal dialogue that we don’t even notice the coffee we are drinking? I notice my own growth and learning; my deepening experience of mindfulness; the deepening acceptance of the changes in my life; changes I’ve made through coaching and NLP. I believe I’m more open to fully experiencing simple activities such as going out for a coffee and scone.